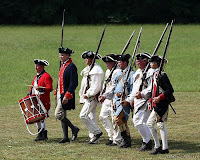 It was a reenactment of the first battle of the Revolutionary War, in Lexington, Massachusetts. I've wanted to go to it for a looong time. My mom used to take us to historical things like that all the time. I got so much out of it as a kid, and I know that boys in particular love those battles. I'm so proud that I finally did it. It's not easy, considering it takes place at 6:00 AM and I'm a night owl. I picked up my friend's son, who lives near there. The kids were great about the whole thing- even Dimitri- running to the field when we were running late and not complaining when the crowd made it impossible to see. Next year we'll bring a ladder for the kids to climb like other families did. Despite the nearly non-existent view- I'm glad we meant. The boys got to feel the excitement and hear the gun shots and see my enthusiasm. Afterwards we went back to my bff's house and she had made a lovely breakfast of eggs and sausage and fresh baked muffins and fruit. We leisurely ate and talked and just had the most wonderful time. What a great memory this will make. It was very nice eating breakfast with you! Way to go for getting up soooooo Early!!! I've been dragging myself all day ..lol..